For thousands of years, people have been building things out of wood. Some of the very earliest buildings were made entirely from the stuff – and this is a practice that continues to this day. But more popular are buildings which are made partially from timber, with other elements being added around a timber frame. This practice has existed for at least ten millennia, and probably more. But it wasn’t until the arrival of the Ancient Romans that architecture using timber took on a new level of sophistication. Today, if you’re building almost anything, you’ll need a supply of timber – which is why you’re never far from a timber supplier, in North Wales or South Shields. Let’s take a look at the history of the material, and see if we can discern how it came to be so tremendously popular. Before the invention of today’s industrial deforestation equipment, chopping down trees was remarkably hard to do. It required a great deal of skill and knowledge to fell a tree in the first place – and transporting it from place to place afterwards was perhaps even trickier. For this reason, logging wasn’t widespread, and so it wasn’t considered worthy of regulation. This allowed the loggers who were active to act with impunity, cutting down whole swatches of woodland and earning a terrible reputation. They would work in the same area, not allowing the forest to recover and causing environmental havoc. Today, things are a little bit different. Logging is performed by large and well-resourced organisations, who are obliged by law to replant new trees after they’ve removed the old ones. Timber (or lumber if you’re American) is wood that’s been processed to form beams and planks. It’s used for everything from the beams in your house to the paper in your printer. If it’s to be used in situations where further shaping is required, like furniture-making, then it’s usually supplied in rough, unfinished log form. The carpenter can then shape the wood to the desired form, and the excess sawdust can be used to create pulp, which in turn can be used to create paper. On the other hand, major construction projects won’t want to waste time cutting wood up themselves, and so timber for new houses is invariably chopped to size en-masse at a separate location before being transported to the building site. 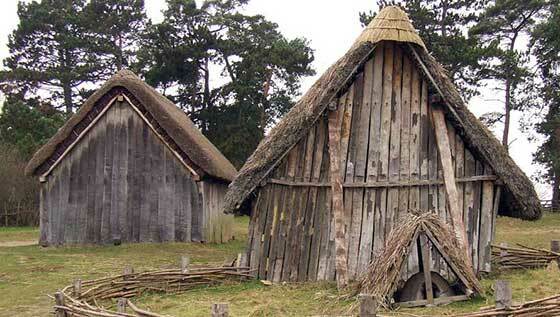 In the first century, the Romans were making extensive use of timber as a framing material in all of their buildings. Examples of this technique are usually destroyed by the passage of time, but a few remain preserved under volcanic ash after the pyroclastic eruption of Mount Vesuvius. We can also find very early examples of timber construction in the Far East, most notably in Tibet, where the temple of Jokhang stands still as one of the oldest and best-preserved wooden buildings in the world. During the 19th century, timber began to fall out of fashion, as architects explored the possibilities offered by metal construction. But this trend was reversed by the end of the 20th century, as architects realised that timber had many strengths, which they were keen to capitalise on. Timber is extremely easy to work with when compared with other materials, and is able to carry weighty loads and bend without breaking. It’s also aesthetically pleasing, and far more environmentally sound than other materials. Would you rather spend an evening in a log cabin or one made out of breeze blocks and cement? What sorts of timber are there? Generally speaking, timber comes in two categories: hardwood and softwood. Hardwood comes from angiosperm trees, which are usually deciduous in temperate climates like ours, but evergreen in tropical ones. These sorts of trees tend to grow much more slowly than their counterparts, which means that their fibres are packed more closely together. They’re used to make hardwood flooring and specialist furniture. Softwood, on the other hand, comes from gymnosperm trees, which grow at a much faster rate. They tend to be used in construction. Despite what the names of these two categories might suggest, softwoods are not necessarily softer, nor hardwoods necessarily harder. The best historical examples of timber framing tend to be built from hardwoods, as these are strong and durable enough to survive for centuries without needing to be replaced. It’s unlikely that the frames of today’s houses will last for quite as long – but they’ll still serve their purpose admirably for several decades or longer. If you’re looking for timber materials, then be sure to pick them up from Richard Williams.